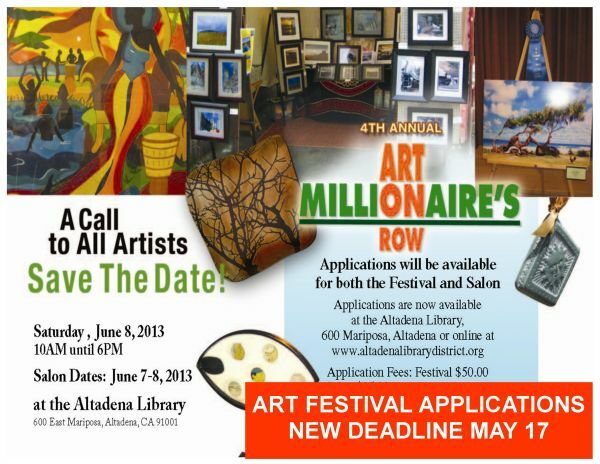 The Altadena Library has extended the deadline for arts and crafts vendors to participate in the "Art on Millionaire's Row" festival. Anyone wishing to display their wres has until Friday, May 17, to submit an application. "Art on Millionaire's Row" will take place Saturday, June 8, from 10 AM-6 PM in the parking lot of the Altadena Main Library, 600 E. Mariposa Street. Applications and information are available on the library’s website at http://www.altadenalibrary.org. For questions, please call (626) 798-0833 or email MHolden@altadenalibrary.org.